Ruthiebear (Titusville, NJ, United States) on 24 June 2016 in Lifestyle & Culture. Jolie banderolle qui exprime la joie. Quelle banderole devant le tableau et la chemine superbe. Very tender message, with a "refined French touch", s'il-vous-plaît ! Wonderful !! "she said "OUI " ! I hope so! Or all that work would have been in vain. Wonderful capture in a lovely mood. A fine selection from all the walls available. I like the exposure and sharp details of this area. 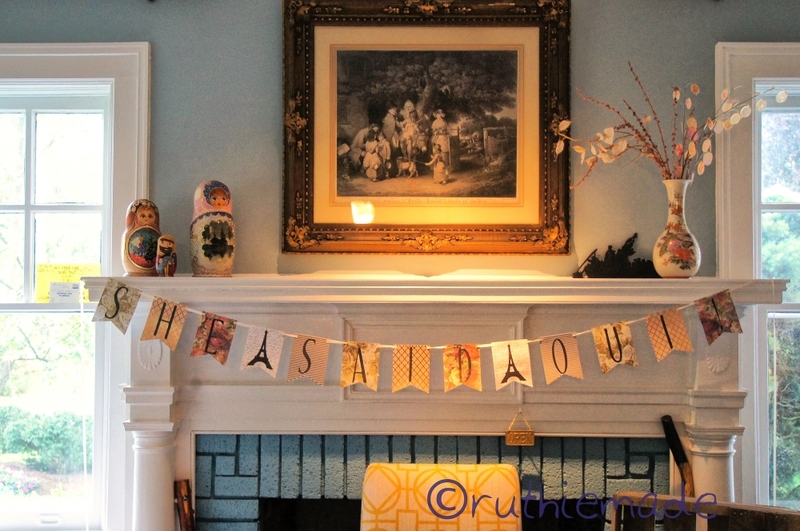 A cute banner perfect for this themed shower!! Clever banner. The decorations are lovely. Oui... je t'aime! Great serie! Hugs to you dear friend! You got a bit of a Russian theme on the mantle to the left. I like the shot !!! A pretty shot of this very clever banner. You put on quite the event for the lucky lady. Very nice. You caught some good light. Are thise Russian nesting dolls spoiling your French theme? That is just wonderful! I love it! Very creative! Beautiful... so satisfying !!!! seems joyous!